The Indian Health Service (IHS) Great Plains Area is one of the best-kept secrets in the world of health care employment opportunities today. With clinical opportunities in more than 15 health profession disciplines, the sky truly is the limit for clinicians hoping to practice in the Great Plains Area. 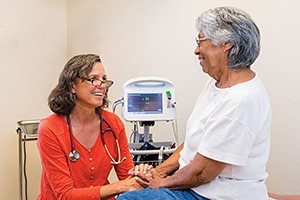 Offering health professionals opportunities to provide comprehensive health care to more than 122,000 American Indians and Alaskan Natives in hospitals, clinics, and outreach programs throughout the Great Plains Area, Indian Health Service provides clinicians with three distinct career path options. Each option offers comprehensive salary and benefits. Indian health professionals are also eligible to apply for up to $20,000 per year in loan repayment of their qualified health profession education loans. That’s not all. An Indian health career within the Great Plains offers clinicians a unique work/life balance, including ample opportunity for recreational pursuits throughout North Dakota, South Dakota, Nebraska, and Iowa. Known for its awe-inspiring natural attractions and landmarks, the Great Plains Area boasts world-class fishing, hunting, hiking, skiing, and more. In addition to opportunities for health professionals, Indian Health Service lays the foundation for the education of future Indian Health Service leaders through three levels of scholarship assistance for American Indians and Alaska Natives. Since its inception in 1977, the IHS Scholarship Program has provided thousands of scholarship recipients with financial support in their educational pursuits leading to careers in health care. What’s more, the IHS Extern Program allows health profession students a chance to receive hands-on instruction while working alongside Indian health professionals. Externships are available for 30 to 120 days during non-academic periods. Externs become familiar with Native communities as well; this cultural experience is invaluable in today’s diverse workplace. Visit ihs.gov/careeropps for more information about the limitless Indian health opportunities available for recent graduates and health profession students within the Great Plains Area. Want to learn more about other great employers and career options? Keep reading our blog and register to search College Recruiter’s website for great internship and job opportunities, and find the right fit for you. Be sure to follow us on LinkedIn, Twitter, Facebook, and YouTube. Recent graduates searching for entry level jobs around the globe may find opportunities in the Middle East and North Africa. Learn more in the following post.